My friend Holly has been taking part in a thing called "Workdesk Wednesday", over at a blog called Stamping Ground. I figured what the heck, I'll post of a pic of my work area. 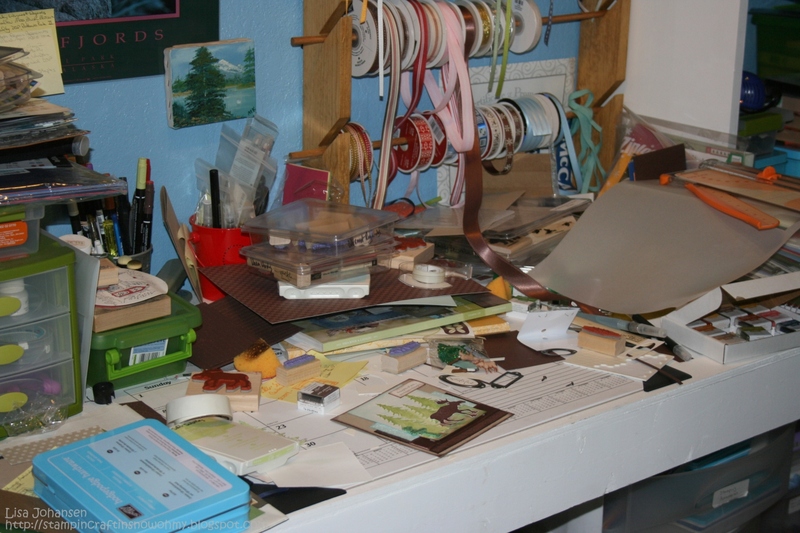 My craft area is NEVER clean and hubby constantly rolls his eyes at the mound of items I have going on. Its in our bedroom(we did away with the closet and turned it onto my workspace,thank you dear!) and when I get going on something paper and stamps end up on the desk, floor, bed...whatever is in reach! Thanks for a peek at your work space. I love your ribbon storage, I could use something like that for mine. Welcome to WOYWW! Great to have you along - love the idea that you transformed your closet - your darling man can't be too upset about your hobby if he was happy to do that! I love the look of your desk, but more - oh my, all those stamps stored above! Wow. Looks like a typical work shop to me:) I am lovin' all of your stamps stored overhead! Well done on having such a busy little crafty area!! Wonderful craft area and so many ribbons, wow. I have visited Alaska and fell in love with it. It is the most beautiful of all the places I visited. Welcome to WOYWW. You're going to love it here. It is very addictive. 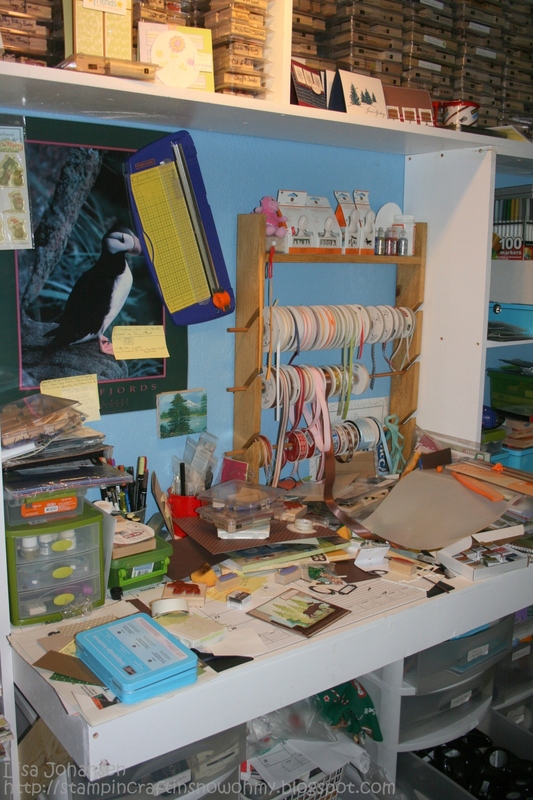 Your craft space is confirmation that it doesn't take a mansion or huge room to craft. It's great that your hubby helped turn the closet into your "studio." Sorry I'm late visiting, and your first time, too, but my computer contracted a virus on Wednesday. It's still not fixed, but I had to make sure I wasn't infecting anyone before I resumed my visits. Happy belated WOYWW. Are those MS Punches new in the package I see??? You better get those out and get busy breaking them in. Now I can see all your stamp sets... wow.. how do you get up there?? and I love the card on your desk too.